Manyin (second left) presents certificate and trophy to the student during the Teresian Excellence Ceremony 2018 while Mary (left), Sarawak Education Department, School Management Sector head Omar Mahli (third left), Roman Catholic Archbishop of Kuching Archdiocese Most Reverend Simon Poh (right) and others look on. KUCHING: Inculcating the culture of critical thinking among the students is crucial to increase the productivity of the workforce and spur the economy development of the country, said Minister of Education, Science and Technological Research Dato Sri Michael Manyin Jawong. Dont chase for paper qualifications but chase for quality education, said Manyin during the SMK St Teresa Teresian Excellence Ceremony 2018 at ACCPC St Joseph Pastoral Centre at Jalan Tun Abang Haji Openg here today. We should prepare, right from the classroom, to create a culture of critical thinking so that we will be creative, innovative and work hand-in-hand with the robots. Your future is not going to be determined by chance but it is going to be determined by choice, he said to the students. Talking on Industry 4.0, he said that the country has to leapfrog to Industry 4.0 as most industrialised countries were already at the Industry 4.0 stage. He stressed that individuals will be evaluated based on their contributions to the companies instead of their resume in the future workplace. He further mentioned that school programmes need to be continuously updated in order to assist the school in achieving greater success than before. Lastly, he reminded teachers in the school to practise new teaching methods in educating their students. Taking Singapore education system as example, he said that the teacher across the causeway were asked to teach less so that the students can learn more. Students need to be seen and heard, he added. On separate note, SMK St Teresa principal Mary John said that total project cost for the two new building s at the school was RM8.2 million of which RM3.2 million had successfully been raised. According to the principal, a fire broke out at the school on Oct 29 2016 that totally destroyed one of the school buildings that housed the teachers room, staff room, library, multipurpose hall and many more. (Out of the RM3.2 million raise) RM1.5 million was from the state government and the rest of it was through our hard work, said Mary who also mentioned that parents-teachers association, board of management, and the public had donated to the school. She added that there will be a dinner on Nov 16 to raise funds for the new construction which chief minister Datuk Pattingi Abang Johari Tun Openg is expected to grace the event. The highlight of the event was the awarding of the Teresian Co-curriculum Excellent 2018 Award, Teresian Academic Excellent 2018 Award and Teresian Excellent 2018 Award. 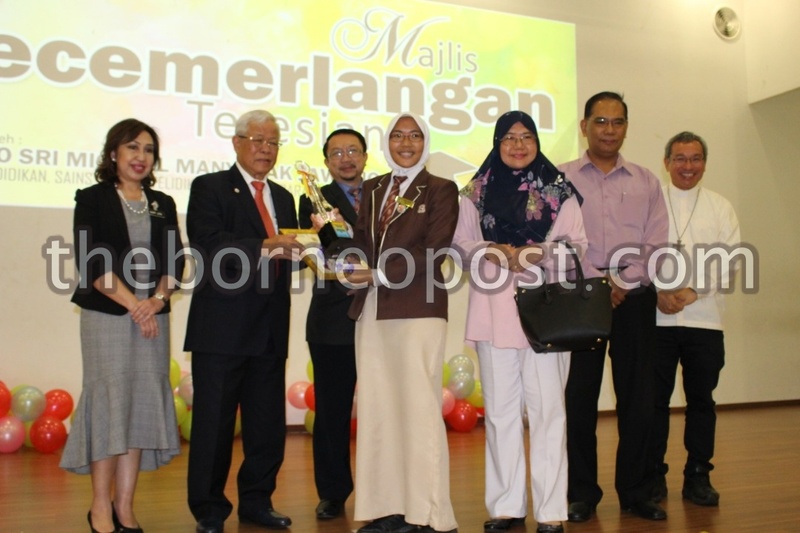 Farah Nabilla Maddarus was awarded the Teresian Co-curriculum Excellent 2018 Award, Nur Izzah Athirah Abdul Samat was awarded the Teresian Academic Excellent 2018 Award while Celine Chua Hui Yue was awarded the Teresian Excellent 2018 Award.